One of the challenges in building an inclusive and engaged college campus is empowering students to leverage campus resources while creating an environment that afford academic success. It is common for colleges and universities to offer diverse courses such African American studies courses to enrich students' learning. Drawing from a larger study focused on the factors influencing the engagement of White students attending public HBCUs, this chapter presents select aspects of the experiences of 22 White students attending two public HBCUs who were required to enroll in an African American studies or African Diaspora course toward degree completion. Despite instances of hypervisibility, a term associated with racial spokesmanship roles or feeling as if one stands out due to characteristics, such as race (Peterson & Hamrick, 2009); students pointed to the positive impact of diverse interactions with peers; strong faculty interaction and difficult class discussions that challenged their critical thinking skills and identity development and growth. This inquiry was guided by the Benchmarks of Educational Effective Practices (National Survey on Student Engagement, 2009), a framework that includes five key categories along with a set of robust, high impact activities delineating the ways students can have deeper engagement and learning experiences. Examples of the benchmarks include: (1) Active and Collaborative Learning; (2) Student-Faculty Interactions, and (3) Enriching Educational Experiences (NSSE). Collectively, these benchmarks encompass behaviors such as posing critical questions during class discussions, engaging with faculty members to discuss topics outside of class (e.g., office hours), and developing relationships with peers outside their race. The findings suggested that the students’ experiences, whether positive or negative, were influenced by the mandatory African American, African Diaspora and other social science courses (e.g., History, Sociology, etc.). These courses offered opportunities for White HBCU students to discuss complex topics centered on race and class in a conducive learning environment (Carter & Fountaine, 2012). These courses resulted in a condition that the author has coined as extended engagement. This mode of engagement is a condition “where the effort and energy of both the individual and the institution were mutual and the students tended to have multiple engagement experiences” (Carter & Fountaine, p.60). 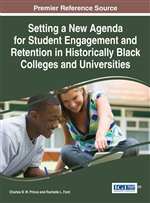 Increasing diversity on Historically Black College and University (HBCU) campuses continues to be an interest of educational scholars and stakeholders across the United States. In the last five years alone there have been a plethora of dissertations, journal articles, books, and op-ed pieces focused on an array of student development topics that include the experiences, perceptions and attitudes as it relates to non-Black student populations such as White, Latino/a, international students (Carter & Fountaine, 2012; Greenfield, 2015; Palmer, Maramba, Allen, & Goings, 2015; Shorette, 2015; Krah, 2013; Mutakabbir, Closson & Henry, 2015; Strayhorn, 2010); non-Black faculty (Johnson & Johnson, 2015); Lesbian,Gay, Bisexual,Transgender,Queer, Intersex, Asexual and Ally (LGBTQIA) students (Strayhorn, Blakewood & DeVita, 2015), women students (Wagner-Winkle, 2015) and Black male collegians, a population that has been covered extensively in the research for a number of years (Billie & Carter, 2012; Cuyjet, 1997; Frazier & Rhoden, 2011; Hilton, Wood & Lewis, 2012; Palmer, Davis & Maramba, 2011).